It has been a little over a year since vCAC 6.0 was released, so many folks who have deployed it in their labs, POCs or other environments for testing purposes are likely to have used the self-signed certificates created in the VAMI at install time rather than generating CA certificates. These certificates are only good for ONE YEAR, so I expect many folks will be running into issues soon if these certificates aren’t replaced before they expire. 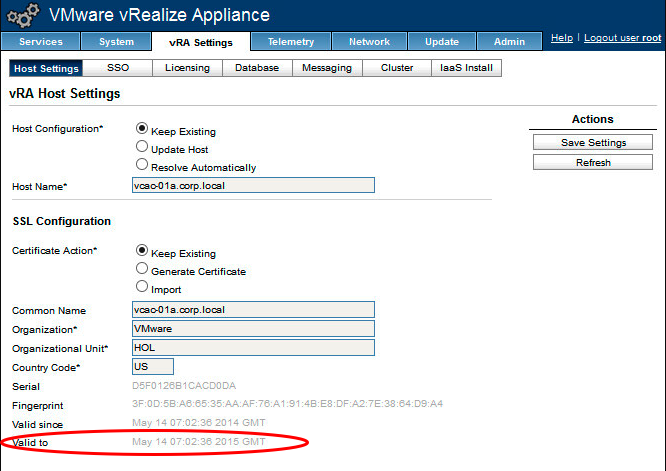 This issue only impacts the vRA virtual appliance and the Windows (IaaS Model Manager) host(s). 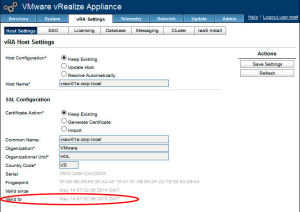 If you are using the SSO identity virtual appliance, its self-signed generated certificate has an expiration date 10 years from deployment, so it won’t have this issue. 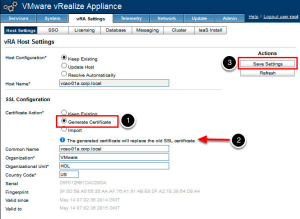 If it has been less than one year since you deployed vRA (vCAC), you can go straight to the vRA VAMI and start the process of updating your certificates. If it has been over a year, and you haven’t done so already, you will need to extend your root user password expiry (you won’t be able to log into the VAMI even with correct password if this is the case). When your certificates are expired, you will receive a 401 – Unauthorized: Access is denied due to invalid credentials error when accessing the Infrastructure tab. The assumption here is that lab environments will typically use a simplistic deployment (single vRA VA and single Windows host for all IaaS components). If that’s not the case, there will be additional work to update certificates on all hosts of the deployment after they are generated. To generate a new self-signed certificate, first choose the Generate Certificate radio button under SSL Configuration (1). You will see an informational alert display that you will replace the old SSL Certificate with this action (2). Then click Save Settings (3). This will take a minute or two to complete. You should see a new expiry date reflected in the Valid to field. Choose Continue to this website when the page loads. 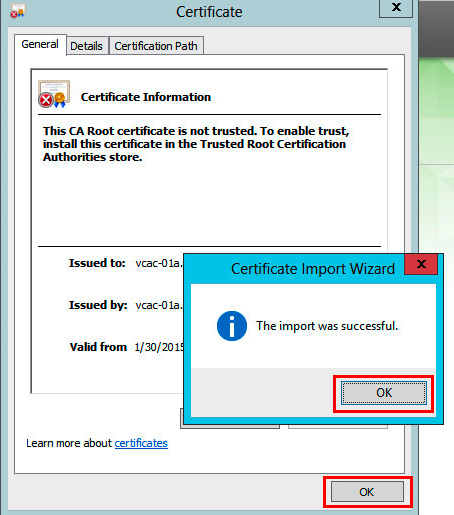 To install the certificate, choose Install Certificate… and complete the wizard to install on Local Machine as shown here. When completed, the following dialog will appear to confirm the certificate was installed properly. Click OK on both to close. On the IaaS Windows host, open the IIS Manager and navigate to the server in the left hand navigation, and open Server Certificates. [<img src="https://grantorchard.com/assets/images/2015/01/IaaS-IIS-Svr-Cert-1-300x188.png"  alt="IaaS IIS Svr Cert 1" width="300" height="188" class="alignnone size-medium wp-image-1179" srcset="https://grantorchard.com/assets/images/2015/01/IaaS-IIS-Svr-Cert-1-300x188.png 300w, https://grantorchard.com/assets/images/2015/01/IaaS-IIS-Svr-Cert-1.png 803w" sizes="(max-width: 300px) 100vw, 300px" />](https://grantorchard.com/assets/images/2015/01/IaaS-IIS-Svr-Cert-1.png)   2. Create new Self-Signed Certificate by clicking on that option on the right side of the window. [<img src="https://grantorchard.com/assets/images/2015/01/IaaS-IIS-Svr-Cert-2-300x103.png"  alt="IaaS IIS Svr Cert 2" width="300" height="103" class="alignnone size-medium wp-image-1180" srcset="https://grantorchard.com/assets/images/2015/01/IaaS-IIS-Svr-Cert-2-300x103.png 300w, https://grantorchard.com/assets/images/2015/01/IaaS-IIS-Svr-Cert-2.png 825w" sizes="(max-width: 300px) 100vw, 300px" />](https://grantorchard.com/assets/images/2015/01/IaaS-IIS-Svr-Cert-2.png)   3. Provide a friendly name for the new certificate. I used similar format to the auto-generated one. Then click _OK_. [<img src="https://grantorchard.com/assets/images/2015/01/IaaS-IIS-Svr-Cert-3-300x229.png"  alt="IaaS IIS Svr Cert 3" width="300" height="229" class="alignnone size-medium wp-image-1181" srcset="https://grantorchard.com/assets/images/2015/01/IaaS-IIS-Svr-Cert-3-300x229.png 300w, https://grantorchard.com/assets/images/2015/01/IaaS-IIS-Svr-Cert-3.png 681w" sizes="(max-width: 300px) 100vw, 300px" />](https://grantorchard.com/assets/images/2015/01/IaaS-IIS-Svr-Cert-3.png)   4. Navigate to the _Default Web Site_ in the left hand navigation tree and open _Bindings_ from the right hand Action menu. * Choose _https / 443_ from the list and click _Edit_. Then select the SSO certificate you just created from the dropdown list and click _OK_. You can then Close the Bindings dialog. 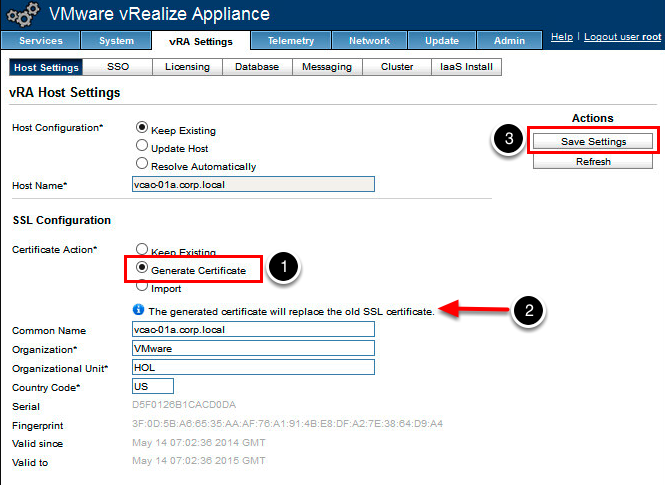 For more information on replacing certificates, see Grant&#8217;s previous posts <a href="https://grantorchard.com/vcac/implementation/replacing-vcac-6-0-iaas-certificates/" title="Replacing vCAC 6.0 IaaS Certificates" target="_blank">Replacing vCAC 6.0 IaaS Certs</a> and <a href="https://grantorchard.com/vcac/implementation/replacing-vcac-6-0-appliance-certificates/" title="Replacing vCAC 6.0 Appliance Certificates" target="_blank">Replacing vCAC 6.0 Appliance Certificates</a>, and also the <a href="http://pubs.vmware.com/vra-62/index.jsp#com.vmware.vra.install.doc/GUID-F493819D-D4FB-4854-BEC4-295388BB6EF7.html" title="vRA Doco - Updating Certs" target="_blank">product documentation</a>. Special thanks, again, to <a href="https://twitter.com/stvkpln" title="Steve Kaplan" target="_blank">Steve Kaplan</a>! Kim Delgado is a Sr Solutions Engineer at VMware. She can be reached at @KCDAutomate.